The very first step that any Operator can take care of their customers is by providing a good Customer Care IVR as that is the first point of contact with the operator for any clarifications,Information,issues or requests.The primary objective of an IVR is to provide detailed information while navigating across various legs, some complex customer requirements needs agent assistance and some customer requirements also needs agent to take up a request for the backend support team in the form of a Service request and get back to the customer with a resolution within a specified time. This IVR system is not fixed as it will be updated on timely basis depending on new services/requirements and the customers were also asked to follow the new IVR instructions carefully to fully utilize the facility. In this busy world only a few actually finds time or patience to fully follow the entire flow of IVR and utilize it to its maximum potential if the IVR is really worthy.So,what in general anyone will do is to find out a navigation leg so that it lands to the customer care executive directly.It is the responsibility of the Operators to let users become aware of their IVR navigation flows and the facilities they can avail using this system.An sms for the same can also be provided to users on timely basis. 1.How effective and informative is the IVR of that particular operator? 2.Can a customer easily flow through the entire Navigation legs? 3.Is the IVR defective ? 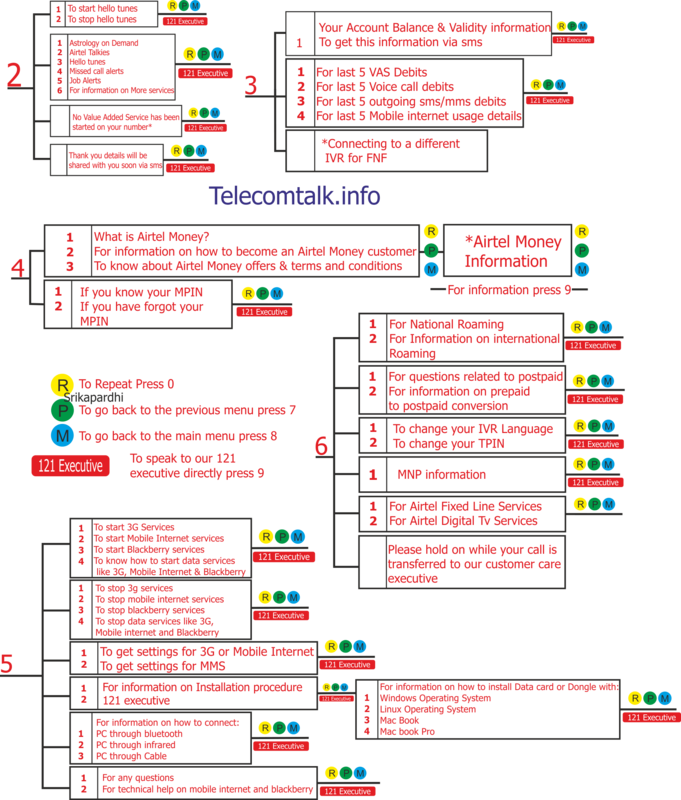 – Some times even if we hear a particular option to chose from we can’t be able to navigate through it.This is a defect from operator end and that needs to be fixed from IT.How effectively operators are maintaining their IVR standards.Our analysis and users feedback can also be used to a set new benchmark standards to operators IVR systems. The main highlight of Airtel IVR system is that every navigation leg is provided with an option to connect with 121 executive directly by pressing 9 which is really a good feature to comfort it’s users from searching for a hidden option to seek agent assistance. Since this is our first IVR info-graphic we can’t come to any conclusion if this is the best or worst.We can have a good comparison of IVR flows once i come up with IVR of other operators as well alphabetically. 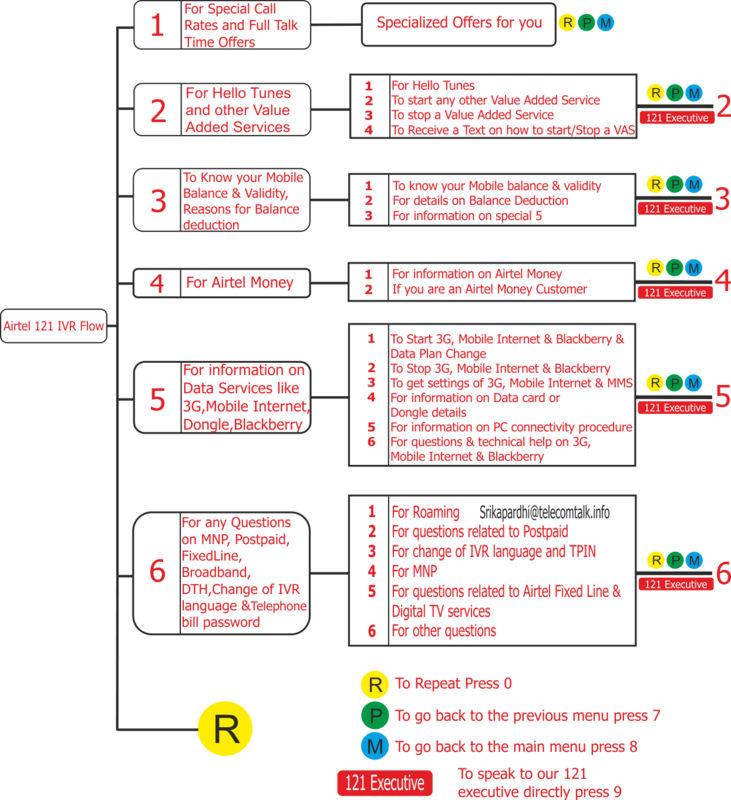 *I have tried my best to come up with a detailed flowchart on how in general an Airtel prepaid customer care IVR looks like.This may differ from circle to circle and with different profile customers.My main intention is to bring an overview on how an Airtel customer can generally flow through the IVR, get information and directly speak to 121 executive if required. PS:It took me nearly 32 hours to come up with this analysis and flowchart and hope it helps.